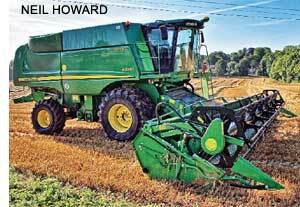 This year the wheat harvesting season witnessed the growing trend towards the use of combine harvesters. This machine combines the tasks of harvesting, threshing, and cleaning of grain. Till a decade ago, most of the wheat crop was harvested manually, mostly by landless or near-landless farm workers from the same or neighbouring villages. They were paid mostly as a share of the harvested producequite often one bojha, or a sackfull out of every 21 bojhas, but this could be more in areas where farm workers were better organized. Whether the share was more, this enabled the landless farm workersgenerally the poorest section of the villageto store some grain stocks which helped keep hunger away during the lean months. During crop harvesting workers were most in demand and even big landowners needed them. This improved the bargaining strength of what was otherwise the weakest and most vulnerable section of rural society. However, with the rapid spread of combine harvesters (mainly for the wheat crop but gradually also some other crops) farm workers lost precisely that employment which was most important. While millions of person-days of employment have been lost in this way in recent years, hardly any attention has been given to this disturbing trend by the government. In addition, millions of tonnes of fodder have been lost. While manual harvesting preserved crop residues as fodder, combine harvester squanders valuable fodder. Combine harvesters leave much bigger or taller stalks in fields. When the left-overs are small, ploughing and related work can take care of these. But in the case of taller, bigger stalks, farmers started taking resort to fires. This contributes to pollution. Sometimes these fires get out of hand and spread to areas, even towards habitations. Soil organisms perish in the fire and the heat, affecting the fertility of fields. But some farmers, particularly the bigger landowners, say that with increasing uncertainty of weather and more intensive cultivation, it is important to harvest quickly. The weather has become unpredictable; unseasonal rain during harvest (as happened this year) damage partly harvested grain lying in open fields. So there is the pressure to speed up harvesting for which combines are hired or bought. Another aspect farmers mention is shortage of farm workers during harvesting. What they do not mention openly is that with the workers becoming more assertive, farmers want to reduce their dependence on them and reduce their bargaining strength, which is highest during the harvesting season. Growing disintegration of rural communities has also contributed to the quest for relying more on machines. In conditions of social homogeneity, probably there would have been more give and take between farmers and workers. They would have made a greater effort to speed up harvesting while farmers would have paid them better and taken better care of them in difficult times. In fact several workers complain it is the lack of justice and dignity in the behaviour of some big farmers and land owners that makes them migrate despite all the uncertainties and difficulties of migrant labour. What is the way out of this conflict of interests and viewpoints? As far as possible, the food security of weaker sections should be prioritized and they should continue to get work at harvest time. This will also help save fodder and protect fertility of land. Concerns of farmers can be met by better cooperation to speed up harvesting.